In less than a decade Google, Amazon, and Salesforce.com went from unknown ideas to powerhouse fixtures in the economic landscape; in even less time offerings such as Linkedin, Youtube, Facebook, Twitter and many others also carved out important roles; in less than five years Apple's iTunes became the largest music retailer in North America. They all share one key strategic decision – each of these organizations chose to harness the power of cloud computing to power their drives to dominance. With roots in supercomputing and many other technical disciplines, cloud computing is ushering in an entirely new economic reality – technology-enabled enterprises built on low cost, flexible, and limitless technical infrastructures. Now you can harness cloud computing's potential for your organization. 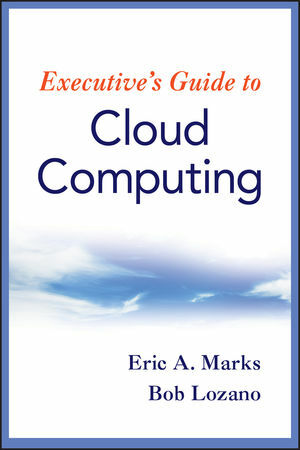 Executive's Guide to Cloud Computing shows you how. ERIC A. MARKS is President and CEO of AgilePath Corporation, a Service-Oriented Architecture (SOA) and Web services solutions firm. He is focused on driving executive insight, strategy, and planning, and business execution of Web services and SOA. A software and technology services veteran with seventeen years of experience with firms including PricewaterhouseCoopers, Cambridge Technology Partners, Novell, Electronic Data Systems, StreamServe, Ontos, and Square D Company/Schneider Electric, he serves on the Advisory Board of Directors for LogicLibrary, the leading software asset reuse firm, and lectures at Syracuse University's nationally recognized School of Information Studies. He is a regular columnist for Computerworld online, Managing Automation magazine, and the industry portal www.SearchWebServices.com. ROBERTO (BOB) LOZANO is chief strategist and founder of Appistry, Inc., a leading provider of cloud application platforms. An experienced entrepreneur with a history of building successful companies, Lozano founded and led PaylinX, a leader in the payment solutions market. He has also held management and technology positions with Southwestern Bell (now AT&T), Monsanto, and Sandia National Laboratories, has lectured on artificial intelligence as an adjunct faculty member at Washington University in St. Louis, and also founded Intelligent Computer Systems. He is a frequent speaker around the industry and blogs at www.thoughtsoncomputing.com.